To make the omelette: Beat the egg, water, salt and pepper together. Heat the butter in a small frying pan until it starts to bubble. Swirl the pan around for the butter to cover the whole surface and then pour in the egg mixture. Tilt the pan to cover the entire base with egg. Use a spatula and draw the sides of the omelette into the centre and let any extra liquid egg run to the edges. Cover the pan with a lid or even a dinner plate and remove when the omelette is almost set. Spoon your preferred filling onto one half of the omelette and, using the spatula, turn the other half over the filling. 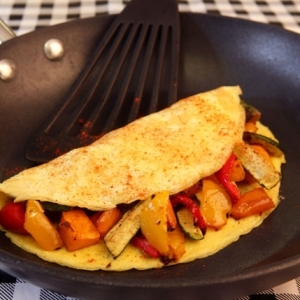 Tilt the pan and slide the omelette onto a dinner plate. Serve.